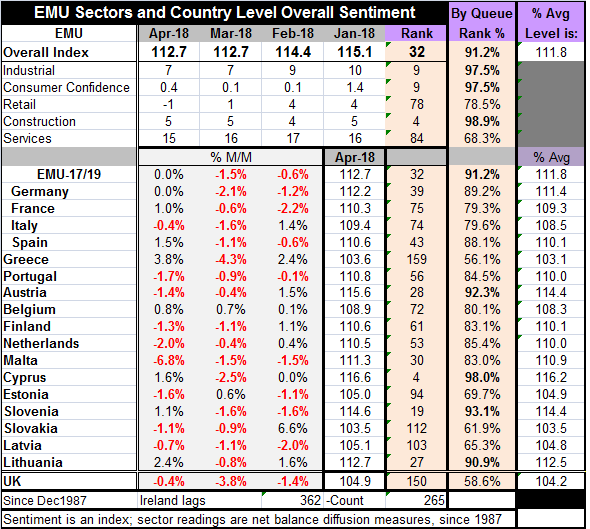 The EU indexes for the EMU area showed an unchanged headline in April at 112.7. The sector indexes showed unchanged conditions in the industrial sector and construction. Falling on the month were retailing and services. The consumer confidence measure increased slightly to 0.4 from 0.1. As usual Ireland did not report in the first wave of data but neither did Luxembourg. Of the 17 reporters, 9 showed deterioration in April. That’s after 15 from this group showed declines in March and eight fell in February. Weakness has been widespread across community members. And despite the fact that the overall EMU index was unchanged this month, country level deterioration remains widespread. Among the big four economics, Germany was unchanged this month and Italy showed a decline All four large economies declined in March and three of four declined in February. The position of these various metrics show the EMU headline has a 91st percentile standing. Construction has a 98th percentile standing. The industrial sector and consumer confidence each have 97th percentile standings. Those are all very strong readings, Retail has a 78th percentile standing. Services have a 68th percentile standing. Clearly, the services sector is lagging. There is a positive by moderate reading for retailing. Retailing’s standing suggests that the consumer is lagging in the recovery as well or introducing early weakness despite strong confidence readings. If the data are looked at by reporting member country, only 4 of them have top 10 percentile standings (Cyprus, Slovenia, Austria and Lithuania). Seven have rankings in their top 20 percentile but lower than the top ten percentile: these are Germany, Spain, Portugal, the Netherlands, Finland, Malta, and Belgium. Italy and France are in the next decile and positioned at its upper edge with both of them sporting a 79th percentile standing. Estonia, Slovakia and Latvia have standings in their 60th percentile decile. Only Greece has a standing in its 50th percentile decile. On balance, the standings show us a great deal of firmness in the EMU region. Most countries are firmly sporting readings above their historic medians placing them solidly in an above average growth zone. But the sector data and their rankings are a bit more worrisome. For now, the strong construction and industrial sectors along with high consumer confidence readings are holding the overall EU indexes high. But consumer confidence seems to be off on its own and is a fanciful reading in a number of places where it seems to have become detached from economic reality. Both retailing and services have much lower readings and they tend to be the job creation sectors. In addition, it is incongruent for consumer confidence readings to be so higher and for retailing and services to be lagging so much below it. To that extent, the weaker performance in those sectors is still very disturbing. However, since late 2016, the services sector is still in a localized upswing despite the drop in the index this month. Retailing has been sluggish for some time and has slipped in each of the past two months from what had been a 22-month high reading. On balance, none of the trends in the euro area are easy to pin down. It is clear that the services and retail sectors are not as strong as construction and the industrial sector or as strong as consumer confidence. But there is no clear evidence of erosion. The construction sector has basically revived over the last five months while the industrial and consumer confidence measures have sagged from local highs made in January. GDP data is now in the process being reported. The U.K. is an EU member on its way out of the arrangement and its Brexit situation is a drag on growth. The U.K. logged its weakest growth in five years in Q1 2018 as GDP rose by only 0.1%. The authorities also blamed bad weather for the result. Spain’s GDP rose by 0.7% q/q in Q1, the same as its fourth quarter gain. French growth slowed to a 0.3% gain in Q1 2018 after a 0.7% advance in Q4 2017. Elsewhere, GDP in Taiwan slowed to a 3% annualized gain in Q1, down from 3.3% in Q4. GDP releases are starting on the low side for 2018. The U.S. was an exception logging a 2.3% annualized quarterly gain for Q1, above the expected 2%. Still, 2% is a moderate number. Today ECB President Mario Draghi admitted that there has been some slowing in growth but expressed confidence in the future. Let’s see if that confidence is warranted and how soon this slowing abates.